Living in a part of the world where loquat is grown, I was more familiar with loquat as a tasty, juicy fruit than with the medicinal properties of its leaves. However, a little research tells me that we should not be so quick to dismiss the other parts of the tree and that we can make plenty of use of its leaves which have a variety of proven benefits for your health. The tree which bears the delicious loquat fruit is an evergreen native to China and Japan but now grown in many parts of South East Asia. Also known by its scientific name ‘Eribotrya japonica’ the tree produces an orange plum shaped fruit with a taste and consistency similar to a hybrid of a peach and a mango. The fruit is eaten alone either fresh or dried but is also used to make delicious jams. While many people will be familiar with the fruit, fewer are aware of the many benefits that can be taken from its leaves. The Japanese in particular use the leaves to make a healthful tea while it is also possible to make healing ointments and poultices from the crushed and ground leaves before applying it to treat minor wounds. Both the loquat fruit and its leaves contain a rich variety of important vitamins and other nutrients. These include pectin, potassium, iron and fiber as well as vitamins A and C.
This diverse array of vital nutrients is excellent for general health purposes but loquat leaves also confer certain specific health benefits that we will look at in detail below. Loquat leaves have been fairly well studied over recent years and research has revealed that many of its health benefits are related to its powerful antioxidant capacity. By now, most people are aware of the importance of getting as many natural antioxidants into our system as possible in order to prevent the free radical damage that wreaks havoc on our health and leads to serious illness. One of the most significant findings regarding loquat leaves is that it might help the body to combat diabetes. It has anti diabetic potential because the leaves produce chemicals known as triterpenes including an acid called tormentic acid. In addition, the Chinese Government has approved the use of loquat leaves to support blood-sugar levels because they help produce polysaccharides which are known to stimulate the production of insulin in the pancreas. Your liver is the body’s powerhouse when it comes to eliminating harmful toxins from the body. Sometimes your liver gets overloaded with work and needs help in order to perform its important functions as well as possible. 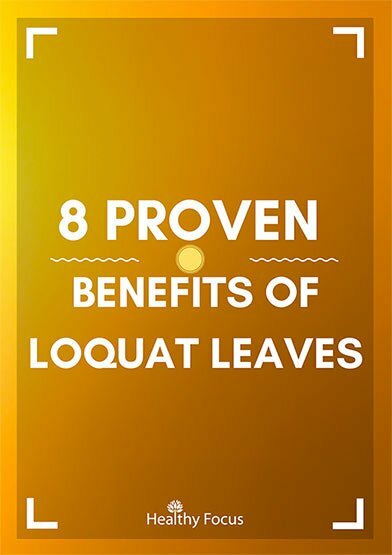 One of the traditional uses of loquat leaves was as a natural remedy for a variety of respiratory problems including congestion, coughing, allergic reaction and lung irritation. Recent scientific research has gone some way to confirming that this historical use had merit. Drinking a nice soothing cup of loquat leaf tea also has an expectorant effect which means it helps loosen mucus and relieve congestion helping you to breathe more freely. When applied topically, loquat leaf can combat the reaction from histamine production which both soothes inflamed skin and helps general skin health. Its antioxidant properties make it ideal for staving off the unwanted effects of free radical damage to the skin. By getting more antioxidants into your system, you can help protect against many of the signs of premature aging like wrinkles and fine lines. Experts believe that oxidative stress as a result of free radical exposure is one of the main causes of neurological degeneration. Because of its powerful antioxidant effects, loquat leaves may prove beneficial in maintaining brain health. So if you feel that you are coming down with a common cold, try brewing up a nice pot of loquat leaf tea and drinking it up a few times a day. It may well prevent a cold from taking hold and could help you recover much faster if you already have an illness. As we age, our bone density becomes lighter and our bones become weaker. This is especially the case in women following the menopause because of the reduced level of estrogen in their bodies. Recent research shows that loquat leaf tea may help combat bone loss from estrogen depletion. In a study published in 2014, mice whose ovaries had been removed were fed loquat leaves which resulted in a significant improvement in bone density in the lumbar area, head and abdomen. Loquat leaf may also help boost the health of your body’s hardest working organ – the liver. The leaf contains a compound called Amygdalin which is proven to support the liver’s health, combat liver disease and to eliminate toxins from the body. While researchers are not certain how amygdalin works, they believe it owes its effect to the antioxidant abilities. Loquat tea is a popular traditional Japanese drink which they call Biwa Cha. It is simple to make and has a mild and pleasant flavor to go along with its multiple health benefits and can be enjoyed either hot or cold. Commercially the leaves are picked when they are green before being washed, cleaned and dried. After drying, they are chopped up into pieces ready to be brewed. Loquat leaf tea is easy enough to make yourself at home provided of course that you can get hold of the leaves. The following is a traditional Japanese recipe for loquat leaf tea. Cut the leaves into finger width strips. Add 5 grams of leaves to 4 cups of water then bring them to a boil in either a kettle or a pot. Turn down the heat and let it simmer for between 10 and 15 minutes. Turn the heat off and allow the tea to steep for a further 10 minutes. Strain the tea, serve and drink up. 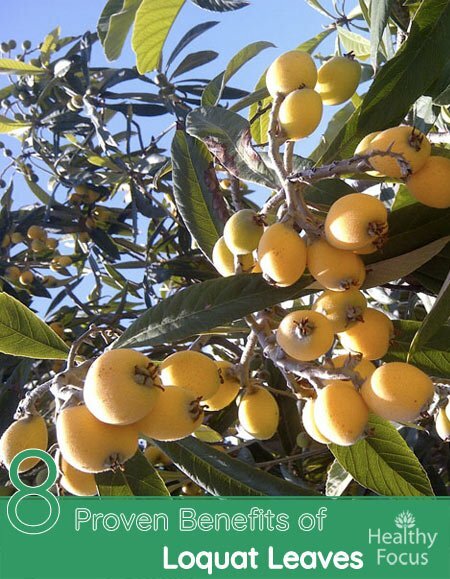 What are the benefits of loquat leaves? Like many plants belonging to the same family, the young leaves and the seeds are slightly toxic to humans. They contain very small doses of cyanogenic glycosides. WWhen digested, these chemicals release cyanide. However, the very low concentration of these compounds as well as the bitter flavor of the leaves means it is unlikely that someone would consume enough to cause any harm. What skin conditions can loquat leaves help treat? Loquat leaves are great for general skin health. They contain excellent antioxidant compounds which can help fight the damage done by free radicals and have an anti-aging effect on the skin. Loquat leaves also have anti-inflammatory properties which can help ease irritation and inflammation caused by a variety of skin conditions including eczema, psoriasis and acne. Loquat leaves appear to be safe and no toxic effects have been found in the studies published so far even at very high doses. There is one isolated report of a 39-year-old male who developed toxic myopathy after drinking 2 liters of loquat leaf extract for 2 weeks. Toxic myopathy is characterized by muscular pain and weakness. Despite this isolated incident, loquat leaf tea would appear to be safe for the vast majority of people with a very small risk of any adverse effects. Loquat is a popular fruit in many parts of Asia but the leaves can also be put to use. They are most commonly used in the form of a tea with excellent antioxidant and anti-inflammatory potential. Research into the benefits of loquat leaves suggests that they can help treat a variety of illnesses including diabetes, liver disorders, respiratory issues and inflammatory skin complaints. The leaves are generally considered safe for consumption in tea form and very few side effects have ever been reported. However, if you are pregnant or breast feeding, we recommend speaking to your doctor before drinking this tea. Have you ever drunk loquat leaf tea or used the leaves in any other way. Let us know of your experiences and whether you recommend it.